Here’s a 2 minutes and 45 seconds Why Replacing Missing Teeth Immediately Is A Must video. See full transcript below. That unpleasant gap in your smile as a result of tooth loss does not only diminish the beauty of your smile. It can also lead to a number of dental and oral health problems which carry huge implications on your overall wellness. When a tooth gets knocked out, the remaining teeth gradually shift towards the direction of the vacated area. This eventually causes your jawbone to shrink and your facial structures to change, making you look a lot older than your actual age. Aside from its negative effect on your aesthetic quality, having missing teeth also affects your self-esteem. It can lead to speech problems, which, when coupled with that incomplete smile, limits your ability to connect and communicate with other people and make great impressions. Furthermore, tooth loss also weakens your bite. As a result, your diet will only be limited to certain foods and you do not really get enough nutrition. Before all these consequences occur, it is crucial that you address tooth loss and have those missing teeth replaced immediately. When it comes to all kinds of Dentures, it is best to consult your reliable denture experts here at West End Denture Clinic. We can provide you with a number of state-of-the-art denture options which are all designed to effectively restore the form and function of your smile. 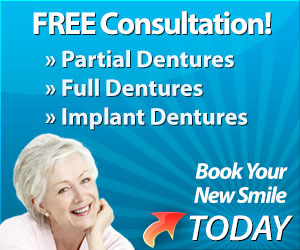 Call us today on (07) 3844 0944 or book online to avail of a FREE Denture Consultation.